Fallen Premier League champions Chelsea avoided another chastening defeat as Terry's flick earned a 3-3 draw which drew the ire of the Spaniard. "The level of the refereeing is diabolical," Martinez told Setanta. It's an incredible injustice, an incredible mistake." And his comments may yet attract the attention of the Football Association's disciplinary chiefs. 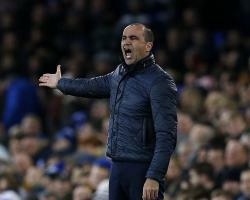 It's not a debate," Martinez added in the post-match media conference. "We had to play seven minutes of injury time and the last action happens at seven minutes and 51 seconds. But to have a player two yards offside in the box is unacceptable. "John Terry with the final touch is two yards offside. It doesn't come down to the interpretation of the referee at all. That makes it difficult to take. "It's a heartbreaking moment for us, because we deserved the three points. It's cost us two points." Martinez did not approach referee Mike Jones or his fellow officials afterwards. The lengthy celebrations following Ramiro Funes Mori's late goal might have contributed to the additional minute being added, with Everton believing they had secured a first league win at Stamford Bridge in 21 years after staving off a Chelsea fightback. Then Terry struck with a deft flick on a 700th club appearance which included an earlier own goal. Hiddink remains unbeaten in six matches since being appointed Chelsea caretaker boss for a second time and admitted his side benefited from good fortune. "I can say now he (Martinez) is quite right," said Hiddink, who replaced Jose Mourinho. Why should I deny it? I have seen it. "Oscar touched the ball and, half a yard, John was offside even though he made a beautiful goal." Terry's own goal and a Kevin Mirallas strike put Everton 2-0 up, but Chelsea scored twice in quick succession to restore parity. A howler from Tim Howard allowed Diego Costa to net and Cesc Fabregas' deflected strike levelled matters. Worse was to follow for Chelsea when Costa limped off and Funes Mori turned in fellow substitute Gerard Deulofeu's cross. Costa immediately went to hospital for a scan on a shin injury. I hope it's not bad." The potential absence of Costa, including in next Sunday's match at Arsenal, could lead to Chelsea making moves in the transfer market. But Hiddink would not be drawn on that prospect. "For the moment we are doing nothing (in the transfer market)," Hiddink said. "We hope Diego comes out the hospital in good health and we go on as we are doing."